Last night’s Smackdown! Live branded PPV, TLC, really drove a point home: no matter how frivolous the matches, feuds, or gimmicks may seem, the Smackdown! Live storytelling will always come through. The Blue brand has done such a good job of making sure a large chunk of their roster matters while laying out explicit, clear motivations for each character, that even a notoriously terrible Chairs match stipulation ends up being one of the night’s better choices. That’s because the hatred between Baron Corbin and Kalisto feels legit, which is really saying something when you consider that the build to their match was basically two injury spots. I bring this up because right now, Raw is missing the clear storytelling component. Where Smackdown! Live is proving that balancing a number of storylines all at once is possible—rising tides lifts all boats, you know?—Raw can barely make its championship feuds matter. Look, there’s a lot of reasons why Raw is, overall, pretty bad right now. The three-hour runtime is a momentum killer, and often leads to WWE putting in a lot of filler; the Cruiserweight division, once assumed to be an asset, has only highlighted the show’s inability to invest in characters; and repetitious storylines can’t find a way to break out of their molds, which is an area where Smackdown! Live typically finds great success. 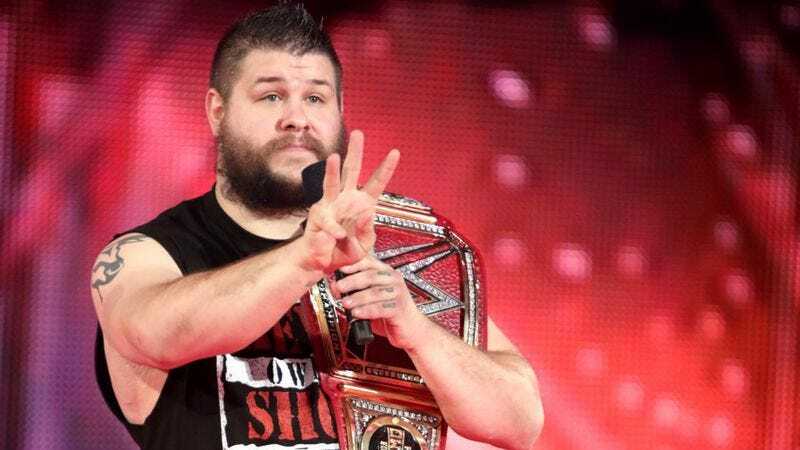 Where the saga of Dean Ambrose, AJ Styles, and James Ellsworth continues to feel fresh, the larger story of Kevin Owens, Chris Jericho, Roman Reigns, and Seth Rollins all circling around the Universal Championship continues to lack definition. There are some good individual performances in the mix—Rollins is finding his footing as a babyface, and Owens and Jericho’s crumbling friendship is playing out perfectly well—but there just isn’t the same innovation and urgency that you see on Tuesday night. With that said, the Roman Reigns vs. Chris Jericho match tonight, where Roman beats Y2J to retain the United States Championship that he doesn’t seem to care about, is a step in the right direction in terms of storytelling. Here, the steps are a little clearer. Coming off of a blowup last week, Owens is eager to make up with his best friend, perhaps realizing that he does need him to hold on to his championship. So, he arranges for a few gifts to be given to Y2J. There’s the aforementioned match with Roman Reigns for the United States Championship, the one that’s eluded Jericho all these years, and a revenge match against Rollins at Roadblock, and a surprise Big Show appearance to soften up Rollins for that match. It’s Owens attempting to make up for his behavior last week, but Jericho is having none of it. He shoots down Owens’ offer to accompany him to the match against Reigns, and then he blames Owens for costing him the match after the fact. That’s simple A-to-B-to-C storytelling, which has been a highlight of the Owens-Jericho friendship. That still doesn’t change the fact that Roman is out here wrestling like a babyface despite the negative crowd reactions, and it doesn’t change the fact that the United States Championship isn’t in any way relevant to the feud. Matches need stakes, and while it’s great to use this match to further the story of Owens and Jericho, there’s no reason we should care about Roman Reigns at this point. His title shot feels like yet another gift he was given, another shot not earned despite the win last week, and that’s only highlighted by the fact that he already has gold slung over his shoulder. This match could have done something to deepen the story of why he’s shooting for the Universal Championship despite having his own title to defend, but Raw never takes that leap. At the very least, we get a stellar Owens-Zayn match out of this mess, a little tease of what could come in the future if Raw ever finds a way to make their mid-card superstars matter. A lot of the matches tonight feel devoid of stakes, even if the in-ring work is good. So, there’s Gallows and Anderson facing off against Cesaro and Sheamus for the honor of losing to New Day next week (wash, rinse, repeat), and there’s Bayley taking on Alicia Fox because of some convoluted story involving a crush on Cedric Alexander. Coupled with Raw‘s heavy focus on recaps—we get to see Charlotte tell off her father three times—that leads to a very sluggish middle hour, where match after match, including a two-second “tussle” between Mark Henry and Titus O’Neil, feels completely insignificant. That doesn’t mean that Raw isn’t doing a few things right, it just means that they often can’t string much together. Take the Cruiserweights for instance. It looks like Raw is finally turning a corner with them, not only following through on Rich Swann as the champion by having him handily beat TJ Perkins tonight, but there’s also a few video segments that actually work to establish who these guys are. Swann’s emotional story makes him an instant draw, an underdog and feel-good story all in one, and the introduction of Jack Gallagher works to make him more than his Gentleman gimmick, giving him a depth of character by having him muse on his loss at the CWC and how it will force him to prove himself on Raw and 205 Live. That’s how the Cruiserweights should have been presented on the main roster from the get-go. Hell, even the Charlotte-Sasha Banks feud, which has been faltering as of late despite the great matches, finds more ways to keep things interesting by having Sasha challenge Charlotte to an Iron Man match at Roadblock. Admittedly, I’m ready for both Sasha and Charlotte to move on to other feuds, but at least the motivations make sense here. This final (fingers crossed) stipulation is the natural extension of their trading wins, and there’s little doubt the match itself will deliver. If only such storytelling was present throughout the rest of the roster’s feuds, because right now Roadblock is shaping up to be an interesting, but largely tension-less PPV that will once again be overshadowed by Smackdown! Live. Results: Seth Rollins defeated Big Show (via countout); Jack Gallagher defeated Ariya Daivari; Kevin Owens defeated Sami Zayn; Rich Swann defeated TJ Perkins; Bayley defeated Alicia Fox; Mark Henry defeated Titus O’Neil; Roman Reigns (c) defeated Chris Jericho (United States Championship match); Cesaro and Sheamus vs. The Club ended in a No Contest. Charlotte absolutely killed that closing promo, despite the crowd’s persistent nonsense. Texas was terrible for two straight nights. Man, Big Show looked great tonight. Leaner build, a hefty beard. I’m digging the look. I like the idea of New Day having to prove themselves to break the record, and a Triple Threat is a great way to do so. I just wish there were more teams in the mix from week to week. Okay, Rusev beating the hell out of Enzo was great, but everything leading up to it was the worst aspects of the Attitude Era repurposed for a PG broadcast. WWE, you don’t get to talk up your “Women’s Revolution” while peddling this garbage week in and week out. What’s even more egregious is that Lana has proven she has a great understanding of her character as a menacing, vengeful, smart, fiercely loyal counterpart to Rusev, and yet here’s Raw undercutting that at every turn. Rich Swann is very good at what he does. My god. It really was nice to have a reminder that Owens and Zayn have incredible chemistry. I’m still not ready for them to have any sort of lasting program—way too soon in terms of where each character is right now—but a one-off match on Raw is fine for the time being.